Nigerian digital publishing company, Publiseer, has been invited to the 2019 Geneva Book Fair by Hayim Delphine, the Cultural Project Officer at the Geneva Book Fair in Switzerland. 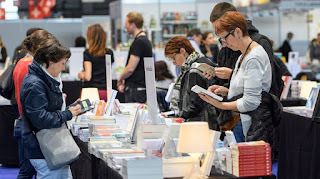 The Book Fair will be holding its 33rd edition from the 1st of May, 2019, to the 5th. The Book Fair, which attracts about 90,000 visitors every year, is the 3rd francophone fair in the world and the only one in Switzerland. "Considering [the] success and the incredible development of Publiseer, we envisage for [them] to come to the next Geneva Book Fair, in order to share [their] experience and present Publiseer," says Hayim Delphine of the Geneva Book Fair. The organizers have also noted that they have some resources to pay for the trip to the Fair and accommodation of a representative of Publiseer. For 15 years, the Fair has welcomed publishers from Africa on its thematic African stage. Thanks to the support of the Swiss Foreign Affairs Ministry, the Fair is able to invite 8 to 10 publishers with their authors and offer them a free booth at the fair. Publiseer has been selected as one of the publishers for the next fair. The Book Fair has also invited representatives from Cultural Ministries in Tunisia, Algeria, Ivory Coast, Cameroun and Senegal. They will also be welcoming Emma Shercliff from Cassava Republic. Considering the success and the constructive content of the debates, the Fair will be reiterating its African Publishing sector session next year, and the thematic will be "books beyond borders".